Sometimes, you really want to impress someone. Sometimes, you need something bigger and more beautiful. Sometimes, you need to feel the silky smoothness of peanut butter in your armpits. Sometimes, you add one line too many and people learn way more about you than they needed to. This gorgeous, enormous, fabulous Masonic sword has nothing to do with peanut butter, but it is *totally* impressive. 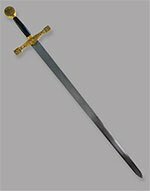 It's a commendable 45 inches in overall length, with a thick 36.5-inch stainless-steel blade and an absolutely gorgeous hilt. The guards and pommel are made from a cast, gilded metal and etched with delightful scrollwork. The hand-and-a-half grip is made from red velvet and is divided neatly by stylish gilt brackets. The hardware is etched with traditional Freemason symbols of power, respect, mathematics and that Illuminati-type eye-in-pyramid which can mean anything from "Divine Providence" to "I have the Holy Grail and you can't have it, you ninny." 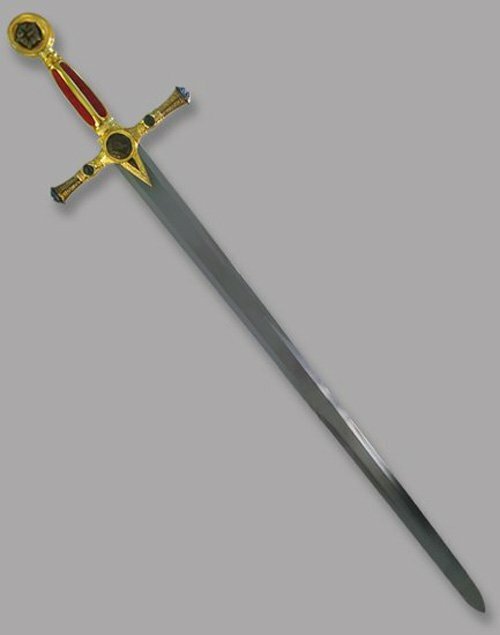 Whether you care about Freemasony things or not, this sword is an absolute attention-getter. It makes a brilliant award or special gift, or just a gorgeous slice of artwork that you can hang from your walls. The long, wide stainless blade is perfect for engraving a personal message, and looks even better with one of our decorative engraving patterns. 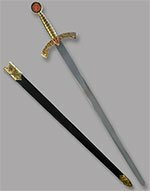 This impressive sword comes with a stylish wood plaque and decorative mounting hardware. Other Materials: Cast and Ornamented Metal Hilt. Velvet Grip. 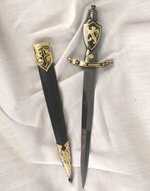 This sword includes a beautiful mounting plaque with hardware.